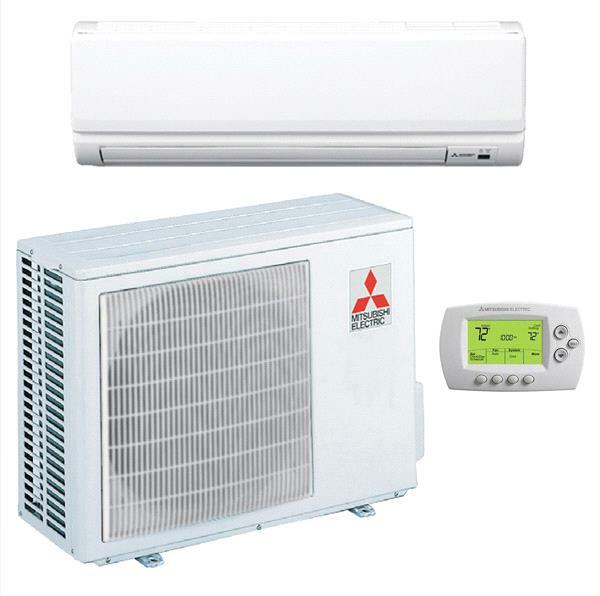 Mitsubishi's Mini-Split systems are some of the highest quality split style air conditioners on the market. Well renowned for incredible efficiency and reliability, the new Mr. Slim line of Mitsubishi Mini Splits represents the pinnacle of modern Mini-Split technology. The PKA/PUY-A12NHA4 Mini-Split air conditioner system is no different. This 12,000 BTU capacity cooling only system is an excellent addition to any home. The incredible efficiency of Mitsubishi's Mini-Split systems will make their mark on not only the temperature of a home, but the homeowner's energy bills as well. The PKA/PUY-A12NHA4 system uses R410A refrigerant, a far more environmentally friendly and less polluting refrigerant. The indoor wall mounted units look great in any home, providing inconspicuous and effective air conditioning to any room. The outdoor unit is mountable on a wide variety of stands and wall mounts, making both placement and connections fast and easy. The Mitsubishi PKA/PUY-A12NHA4 Mini-Split system is truly one of the best investments a homeowner can make. Mitsubishi Electric delivers flexible and convenient cooling and heating solutions to almost any commercial, institutional or large residential application. Choose from small, quiet indoor and outdoor units that operate with the increased efficiency you need. Whether in a church, office building, school, nursing home, restaurant, retail store, or equipment room, the compact design of the indoor units make cooling and heating difficult spaces a breeze. With wall-mounted, ceiling-recessed, ceiling-suspended and horizontal ducted options, capacities of up to 42,000 Btu/h of cooling or heating performance and Hyper-Heating INVERTER P-Series technology that provides 100 percent heating capacity down to 5Ëš F, Mitsubishi Electric systems have the perfect solution for almost any building. INVERTER TECHNOLOGY - You can enjoy high-speed cooling and heating and consistent delivery of comfort year-round. EASY INSTALLATION - Installs quickly room by room with minimal interruption. ZONE CONTROL - You can cool and heat only those spaces desired for maximum control and energy efficiency. ADVANCED MICROPROCESSOR TECHNOLOGY - Built in electronics ensure efficient operation and maximum performance for optimum comfort. LOW AMBIENT COOLING DOWN TO 0ËšF OUTDOORS (REQUIRES WIND BAFFLE) - This feature is perfect for computer network centers and telecom equipment rooms that need help to stay cool down to 0Ëš F outside. ENVIRONMENTALLY FRIENDLY REFRIGERANT - Mitsubishi systems use R410A, an environmentally friendly refrigerant. Convenient and efficient zone control means you can cool or heat only the spaces in use.You can even have single or dual controllers connected to one system.The controller does not even have to be in the space shared with the indoor unit. Features of the controller include a weekly timer, temperature range limiting, auto-off,expanded fault codes, and service call number display. The units use only three polarity sensitive wires plus a ground conductor run from the outdoor to the indoor unit, providing both power and communication connections.Two non-polar wires connect the indoor unit and wall-mounted controller.This wiring design helps avoid installation errors. An optional wireless remote controller kit is available for the ceiling-mounted indoor units. Mitsubishi outdoor units are designed with easy service and maintenance in mind. Maintenance points are located behind easy-access panels to make installation and service effortless for a trained technician. Four-way piping access allows connection in four directions: front, rear, right and bottom (all PUY/PUZ models). Mitsubishi outdoor units come with enough refrigerant to be installed 70 feet (PUY(Z)12-36) and up to 100 feet (PUY(Z)42) from the indoor units. Linesets can be run up to 100 feet from PUY(Z)12-18 outdoor units and 165 feet from PUY(Z)24-42 outdoor units when additional charge is added. Thanks to unique design profiles and R410A refrigerant,these systems are easier to fit into any space. R410A is environmentally friendly with zero Ozone Depletion Potential (ODP). Heat pump systems use our hot-start technology to provide warmth from the beginning by ramping up fan speed as the coil warms. When you want warm air without annoying drafts, that’s what you’ll get. The ability of these units to operate effectively in low temperatures,along with the addition of a low-ambient wind baffle accessory, allows for a space to be air-conditioned even when it is as low as 0Ëš F outside. This cooling ability is important when dealing with electronic equipment rooms, telecom substations, surveillance mechanical rooms, restaurant kitchens, fitness centers and more. By adding the required accessories to the PKA/PUY-A12NHA4 Mitsubishi Mr. Slim Cooling Only Wall Mounted System you are receiving a complete solution completely ready for installation, so your contractor does not need to purchase required Mitsubishi accessories to finish the installation.